This summer I have been joining in on some really interesting conversations at the ETFO Community Portal. ETFO stands for Elementary Teachers Federation of Ontario. We've been discussing everything from our vision for elementary schools in Ontario to bullying to class blogs and walking school buses! I have found it truly fascinating. I honestly had no idea how different things could be from one school to the next, even in the same province. There has also been some discussion of IEP's... Individual Education Plans and the role of EA's (Educational Assistants) in the classroom. As the mother of a special needs kid those two things are very near and dear to my heart. Aiden has an IEP and a full-time EA with him at all times because he has Autism. The IEP helps us all (teacher, EA, special education director, principal & parents) stay on the same page. Aiden's IEP means that his curriculum is modified from the neurotypical kids in his class and his EA works with him every step of the way. Tonight Aiden and I were talking. We made a deal this summer that if he brushed his hair regularly he could keep it long. I reminded him daily of our deal but he simply refused to brush his hair. So today we were discussing when to cut his hair. Not surprisingly he is NOT happy about the impending hair cut. Aiden: I don't want my hair cut because I will look ugly and everyone has long hair! I want to be the same as everyone else. I already am different because I have Autism I don't want to look different too. That was heartbreaking for me to hear. My poor sweet little boy is all too aware of his differences and it breaks my heart that he so badly wants to be just like everyone else. We are working on helping him be happy with who he is, helping him understand his Autism and how it makes him unique and that is ok! Clearly he is not at the "ok with it" point yet but we want him to know that WE are ok with him just the way he is. I took out Aiden's school pictures and pointed out that only 1 boy had longish hair so really, short hair would not look unusual. I also pointed out that he was not the only child in his class that had something inside to deal with- I pointed out the little boy with FAS and the 2 boys with ADHD and the little girl with major anxiety and the kid who is allergic to almost everything. I said "Aiden, everyone is different in some way. We all have things we have to deal with inside of ourselves. For mommy it is depression and anxiety, for daddy it is ADD and being allergic to trees and grass, for you it is Autism, for Owen it is ADHD, for Olivia it is how scared she is of leaving mommy and that she gets pneumonia every winter, and every single kid in your school has SOMETHING they have to deal with. You are NOT the only one." After we finished our conversation I was looking at his class picture and thinking how truly incredible his teacher was for being able to handle all those kids with all those different needs. Aiden's EA was nothing short of brilliant in the way she handled my son. Really. In my opinion we sometimes ask far too much of our Elementary school teachers and EA's. We ask them to handle a lot - children with everything from Autism and mental illness to severe allergies and physical disabilities. I honestly believe they should have access to more specialized PAID training and support for dealing with all these special needs. A little extra training can make all the difference- for the teacher, EA and child!! 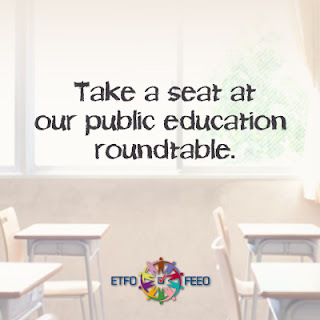 If you have kids in school in Ontario check out the ETFO community portal and join the conversation. You can also follow the #ETFO and #KidsMatter hashtags on twitter.